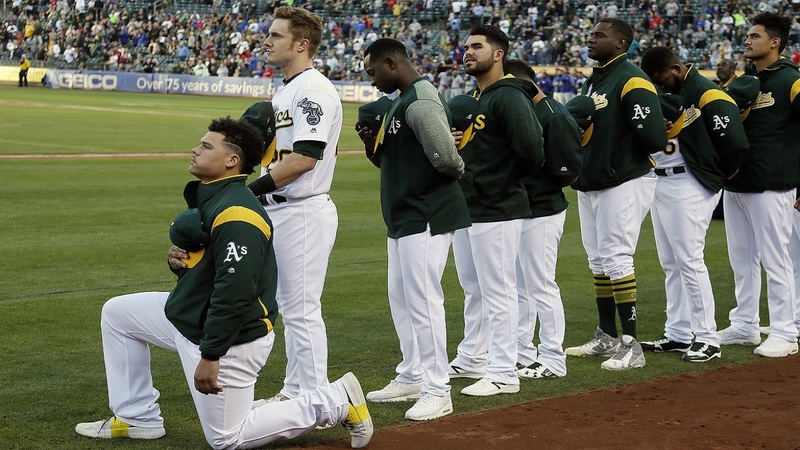 OAKLAND, California (WABC) -- Bruce Maxwell of the Oakland Athletics has become the first major league baseball player to kneel during the national anthem. Maxwell dropped to a knee just outside Oakland's dugout on Saturday, adopting a protest started by former San Francisco 49ers quarterback Colin Kaepernick in response to police treatment of blacks. Maxwell's teammates stood in a line next to him. Teammate Mark Canha, who is white, put his right hand on one of Maxwell's shoulders. The Athletics released a statement on Twitter shortly after the anthem, saying they "respect and support all of our players' constitutional rights and freedom of expression." Maxwell's protest comes after President Donald Trump denounced protests by NFL players and rescinded a White House invitation for NBA champion Stephen Curry in a two-day rant that targeted top professional athletes.